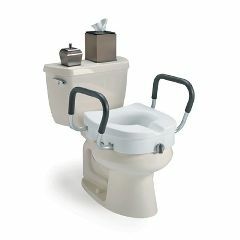 Hinged Elevated Toilet Seat - 3"
The Invacare Clamp-On Raised Toilet Seat offers a seat with arms that provide more stability for the user. It comes with a contoured seat for the user. The seat has a locking mechanism that tightens easily with one hand. Ample depth of front recess makes hygiene performance more convenient. Clamp-on locking mechanism tightens easily with one hand. The seat offers a 300lbs weight capacity. Seat To Floor Height: 5"
Arms could fit tighter bu. But still secure. Great product, easy to install. Great product, easy to install and cheaper than buying a taller toilet. This was a durable raise toilet seat. Spouse of surgery patient. Family member. Regarding toilet seat riser, your Item # 8351 I find that urine flows down the inside front, encounters the screw tightening mechanism, and disperses between the toilet seat riser and the ceramic bowl of the toilet. This flow of urine then runs down the exterior of the ceramic bowl and onto the floor. Is there an installation technique or home remedy to prevent this urine leakage? I don't want to have to clean the riser apparatus, the toilet and the floor every time I urinate... Other than this one problem I give your product and absolute 100%. It is sturdy, comfortable and is most easy to install. does this toilt come elongated or only round model? will not fit on elongated bowl I have a new one here in box I can't use due to elongated bowl.I use a commodeover toilet wiyh splash guard instead. Will this Seat fit correctly on and elongated bowl. I have Kholer San Raphael toilets. The opening is 12" round however the bowl is 18" front to back but it is 17" wide towards the back. There are no holes underneath the bowl. Would this or any other seat that can be securely anchored fit these toilets? what is the weight capacity? how much does this seat raiser raise the seat 3" or 5"
Will it fit on a Standard Round Toilet? Yes, it fits on all toilet seats. Mine is elongated, and it fits on there even though the seat is round. Just make sure you tighten it every few days, just to keep it safe. Don't depend on the handles to lift you. They are more for balancing. You'll like this. Yes. It fit mine very well with no slippage. It fits well on elongated commode. How tall is the riser? Will it fit correctly on an elongated bowl. My customer does not like the round front. Do you have to remove existing toilet seat before you install this? Is this portable enough for traveling? Great Job Allegro! I ordered my belly bags and they arrived the next day without a hitch. Thanks to Andrea for such a great job! !